Originally posted at Tue 18-08-2009 19:57:53, last modified at Sun 06-09-2009 09:56:29, in the personal category. I'm quite stressed out right now. One of two my beloved cats, Mila, is missing! About two months ago, I decided to let Sam - my other cat - out of the house every now and then, in an attempt to stop it from peeing and hurling everywhere in the house. Sam seemed to be having a great time outside, and Mila didn't seem to feel the need to go out of the house too. In the beginning I watched her closely, but she never made an attempt to leave the house. However, last wednesday, August 12th, I forgot to close a window and when I came down late in the evening to close it, I saw Mila and Sam leaving my garden together. I thought they would come back the following morning, as Sam always does, but Thursday morning, it was indeed only Sam who had returned! I haven't seen Mila in almost a week now :( She's a very timid, scared cat and I hope she's alright. 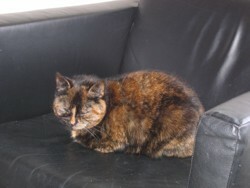 Already filed a missing animal report with the local animal shelter, hoping that if she turns up there I'll get a call. But there's more bad news. Mila (like Sam) has a microchip implanted in her skin for easy identification purposes. But I've learned today that I shouldn't be so sure it'll help me in anyway!! It seems that there are a lot of companies producing these chips, and the nice lady of the animal shelter said that these days, they need more than ten different scanners/readers to be able to handle all different types of chips!!! :'( Mila please come back! She's back!! :-)) Mila was in my backyard again when I woke up this morning, and this time using the oldest trick in the book - food - I was able to lure her back into the house ^_^ She's a little wilder than before, and this time seems to actually fight for her food, but that's terrific! I'm sure that with a lot of gentle handling I can get her to ease down again. So happy! !